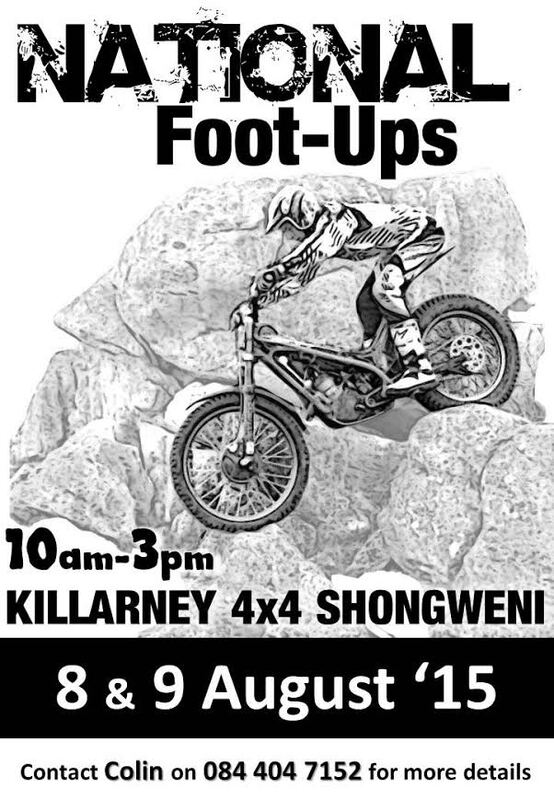 The National off-road bike competition will be held at Killarney 4×4, Shongweni Valley, Durban on Saturday, 8 August 2015 and Sunday,9 August 2015. Gates open at 07:00am. Event start at 10:00am until 16:30, on both days. Bring the family and join us at this exciting event! R100.00 per Adult per night sleeping. – This includes the Event Entrance fees for the weekend! 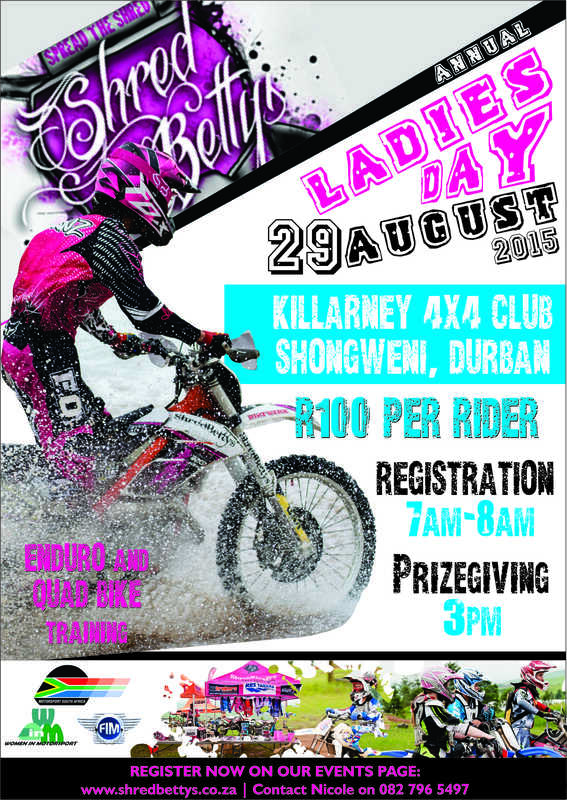 For Camping Reservations contact Nicolien on 031 – 769 2427 / 076 720 1307. The site is ready. The marking is complete. The course is finished. The King of the Night Enduro Winter Series is designed to challenge rider skills and endurance. 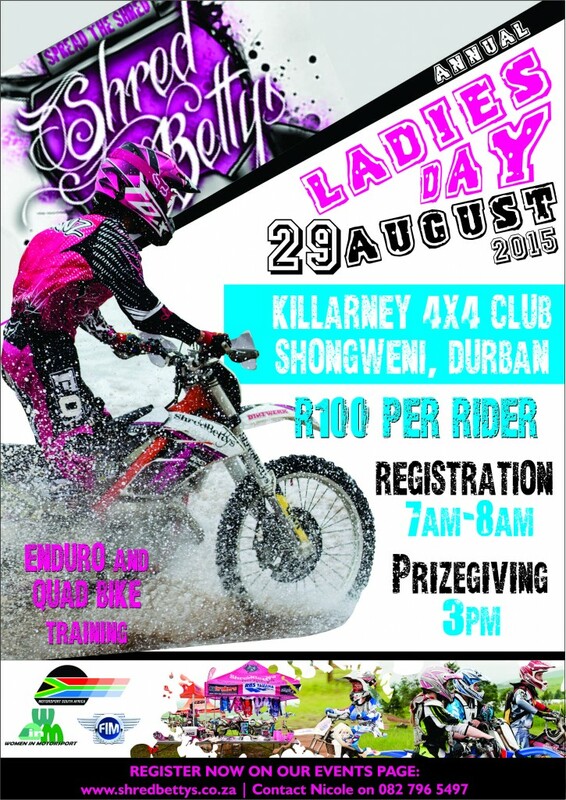 The race will consist of the following classes: Pro Elite, Pro B, Seniors, Highschool / Juniors, Ladies Class. Do as many laps as you can in 2 hours on a special stage, with a few added obstacles thrown in for a little more “fun”. Each class will start together and race a timed race for 2 hours. First three across the line take the glory! The top 30 percent of each class will also progress into a shoot out for a special grand prize. 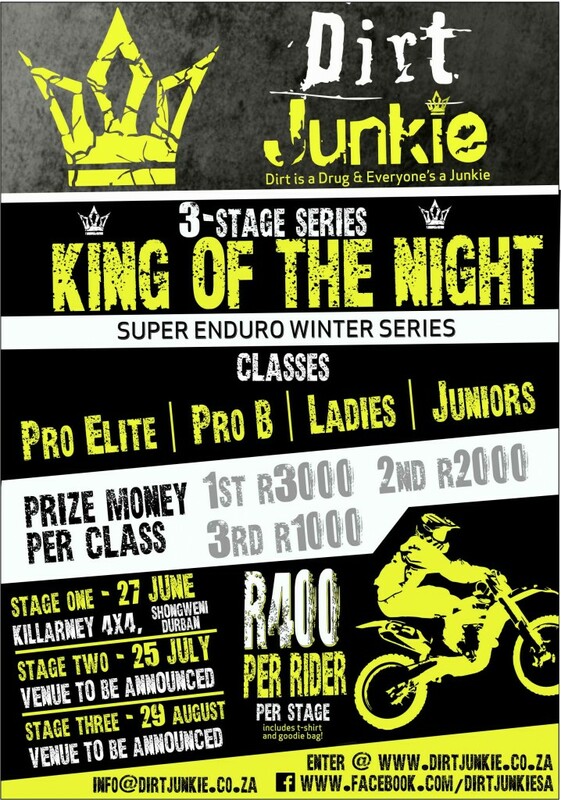 Every stage is worth points toward the overall King of the Night Super Enduro Winter Series winner. Points are awarded from 1st place through 20th place for each stage. Racers from each category with the most points after 3 stages over the event dates will be the overall Series Champions. In the event of a tie, the winner will be determined by the fastest time based on the last event date. The Highschool/Juniors class will be a 1hr 15min race on a similar track to the others, but will start first at dusk. The rest of you will be ‘in the dark’ so get your bike and headlights ready! 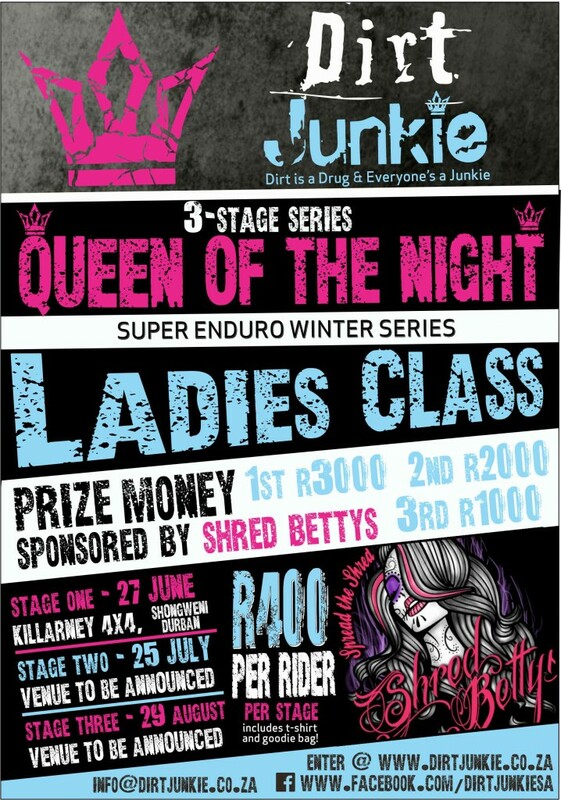 R400 per rider per stage or R300 per rider if all stages entered and paid for up front. Entry includes a free T Shirt and Goodie Bag. Camping – R100.00 per Adult per night and R50.00 per child (5-15 yrs) per night. Kids under 5 are FREE.